Rocky Mount Toyota is Home of the LIFETIME WARRANTY on Lifetime Certified vehicles. All vehicles are sold on a first come first serve basis due to multiple people interested in the same vehicles without prior knowledge.Pricing Info Good Today Through Close of Business. Prep and Delivery Cost May Apply. **BACK-UP CAMERA**, **BLUETOOTH**, SMARTPHONE CONNECTIVITY - BLUE TOOTH, **CRUISE CONTROL**, **LOCAL TRADE**, **USB CHARGING PORT**, **CARFAX-CLEAN/NO ISSUES**, **EXCLUSIVE NATIONWIDE LIFETIME WARRANTY**, **CARFAX ONE OWNER**, ABS brakes, Active Cruise Control, Alloy wheels, Electronic Stability Control, Illuminated entry, Low tire pressure warning, Remote keyless entry, Traction control. CARFAX One-Owner. Clean CARFAX. Priced below KBB Fair Purchase Price! Certified. 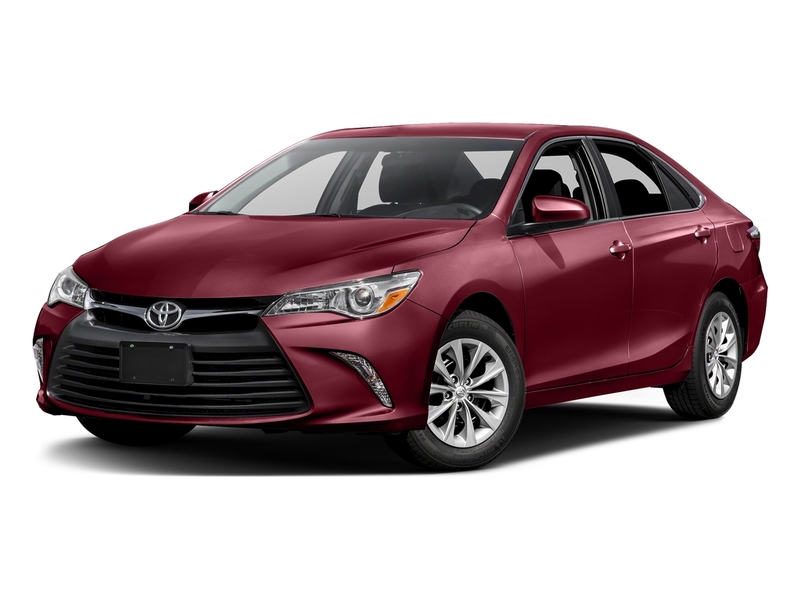 29/41 City/Highway MPG<br><br><br>2018 Midnight Black Metallic Toyota 4D Sedan Camry LE 2.5L I4 DOHC 16V FWD 8-Speed Automatic<br><br>At Rocky Mount Toyota we believe in "LIVE MARKET PRICING" on all vehicles in our inventory. We use real-time market price comparisons to constantly adjust prices to provide ALL BUYERS The BEST VALUE PRICE possible. Pricing Info Good Today Through Close of Business. Prep and Delivery Cost May Apply. We utilize state-of-the-art technology to constantly monitor pricing trends in order to offer our shoppers our best competitive pricing and value. Our entire team is committed to helping you buy a car the way we would want to buy a car! Proudly serving all of North Carolina, Rocky Mount, Wilson, Nashville, Raleigh, Cary, Wake Forest, Rolesville, Elizabeth City, Wilmington, Spring Hope, Greensboro, Greenville, Roanoke Rapids, Bunn, Wendell, Zebulon, Middlesex, Louisburg, Oxford, Riley Hill, Durham, Chapel Hill, Tarboro, Bailey, Stantonsburg, Elm City, Snow Hill, Winterville, Ayden, Kinston, La Grange, Freemont, Pine Tops, Macclesfield, Pikeville, Halifax, Warrenton, Wendell, Weldon, Jackson, Smithfield, Selma, Clayton, New Bern Wake County, Nash County, Virginia and surrounding areas. Rocky Mount Toyota is Home of the LIFETIME WARRANTY on Lifetime Certified vehicles. All vehicles are sold on a first come first serve basis due to multiple people interested in the same vehicles without prior knowledge.Pricing Info Good Today Through Close of Business. Prep and Delivery Cost May Apply. **BACK-UP CAMERA**, **BLUETOOTH**, SMARTPHONE CONNECTIVITY - BLUE TOOTH, **CRUISE CONTROL**, **USB CHARGING PORT**, **CARFAX-CLEAN/NO ISSUES**, **EXCLUSIVE NATIONWIDE LIFETIME WARRANTY**, **CARFAX ONE OWNER**, ABS brakes, Alloy wheels, Electronic Stability Control, Heated door mirrors, Illuminated entry, Low tire pressure warning, Remote keyless entry, Traction control. CARFAX One-Owner. Clean CARFAX. Priced below KBB Fair Purchase Price! Certified. 24/33 City/Highway MPG<br><br>Awards:<br> * 2017 KBB.com 10 Best Sedans Under $25,000 * 2017 KBB.com 10 Most Comfortable Cars Under $30,000 * 2017 KBB.com Best Resale Value Awards * 2017 KBB.com 10 Most Awarded Brands<br><br>2017 Celestial Silver Metallic Toyota 4D Sedan Camry SE 2.5L I4 SMPI DOHC FWD 6-Speed Automatic<br><br>At Rocky Mount Toyota we believe in "LIVE MARKET PRICING" on all vehicles in our inventory. We use real-time market price comparisons to constantly adjust prices to provide ALL BUYERS The BEST VALUE PRICE possible. Pricing Info Good Today Through Close of Business. Prep and Delivery Cost May Apply. We utilize state-of-the-art technology to constantly monitor pricing trends in order to offer our shoppers our best competitive pricing and value. Our entire team is committed to helping you buy a car the way we would want to buy a car! Proudly serving all of North Carolina, Rocky Mount, Wilson, Nashville, Raleigh, Cary, Wake Forest, Rolesville, Elizabeth City, Wilmington, Spring Hope, Greensboro, Greenville, Roanoke Rapids, Bunn, Wendell, Zebulon, Middlesex, Louisburg, Oxford, Riley Hill, Durham, Chapel Hill, Tarboro, Bailey, Stantonsburg, Elm City, Snow Hill, Winterville, Ayden, Kinston, La Grange, Freemont, Pine Tops, Macclesfield, Pikeville, Halifax, Warrenton, Wendell, Weldon, Jackson, Smithfield, Selma, Clayton, New Bern Wake County, Nash County, Virginia and surrounding areas. Rocky Mount Toyota is Home of the LIFETIME WARRANTY on Lifetime Certified vehicles. All vehicles are sold on a first come first serve basis due to multiple people interested in the same vehicles without prior knowledge.Pricing Info Good Today Through Close of Business. Prep and Delivery Cost May Apply. **BACK-UP CAMERA**, **BLUETOOTH**, SMARTPHONE CONNECTIVITY - BLUE TOOTH, **LOCAL TRADE**, **USB CHARGING PORT**, **EXCLUSIVE NATIONWIDE LIFETIME WARRANTY**, **CARFAX ONE OWNER**, ABS brakes, Alloy wheels, Electronic Stability Control, Heated door mirrors, Illuminated entry, Low tire pressure warning, Remote keyless entry, Traction control. CARFAX One-Owner. Priced below KBB Fair Purchase Price! Certified. 24/33 City/Highway MPG<br><br>Awards:<br> * 2017 KBB.com 10 Most Comfortable Cars Under $30,000 * 2017 KBB.com 10 Best Sedans Under $25,000 * 2017 KBB.com Best Resale Value Awards * 2017 KBB.com 10 Most Awarded Brands<br><br>2017 Celestial Silver Metallic Toyota 4D Sedan Camry SE 2.5L I4 SMPI DOHC FWD 6-Speed Automatic<br><br>At Rocky Mount Toyota we believe in "LIVE MARKET PRICING" on all vehicles in our inventory. We use real-time market price comparisons to constantly adjust prices to provide ALL BUYERS The BEST VALUE PRICE possible. Pricing Info Good Today Through Close of Business. Prep and Delivery Cost May Apply. We utilize state-of-the-art technology to constantly monitor pricing trends in order to offer our shoppers our best competitive pricing and value. Our entire team is committed to helping you buy a car the way we would want to buy a car! Proudly serving all of North Carolina, Rocky Mount, Wilson, Nashville, Raleigh, Cary, Wake Forest, Rolesville, Elizabeth City, Wilmington, Spring Hope, Greensboro, Greenville, Roanoke Rapids, Bunn, Wendell, Zebulon, Middlesex, Louisburg, Oxford, Riley Hill, Durham, Chapel Hill, Tarboro, Bailey, Stantonsburg, Elm City, Snow Hill, Winterville, Ayden, Kinston, La Grange, Freemont, Pine Tops, Macclesfield, Pikeville, Halifax, Warrenton, Wendell, Weldon, Jackson, Smithfield, Selma, Clayton, New Bern Wake County, Nash County, Virginia and surrounding areas. Rocky Mount Toyota is Home of the LIFETIME WARRANTY on Lifetime Certified vehicles. All vehicles are sold on a first come first serve basis due to multiple people interested in the same vehicles without prior knowledge.Pricing Info Good Today Through Close of Business. Prep and Delivery Cost May Apply. **BACK-UP CAMERA**, **BLUETOOTH**, **CRUISE CONTROL**, **CARFAX-CLEAN/NO ISSUES**, **EXCLUSIVE NATIONWIDE LIFETIME WARRANTY**, ABS brakes, Alloy wheels, Electronic Stability Control, Heated door mirrors, Illuminated entry, Low tire pressure warning, Remote keyless entry, Traction control. Clean CARFAX. Priced below KBB Fair Purchase Price! Certified. 24/33 City/Highway MPG<br><br>Awards:<br> * 2017 KBB.com 10 Best Sedans Under $25,000 * 2017 KBB.com 10 Most Comfortable Cars Under $30,000 * 2017 KBB.com Best Resale Value Awards * 2017 KBB.com 10 Most Awarded Brands<br><br>2017 Cosmic Gray Mica Toyota 4D Sedan Camry SE 2.5L I4 SMPI DOHC FWD 6-Speed Automatic<br><br>At Rocky Mount Toyota we believe in "LIVE MARKET PRICING" on all vehicles in our inventory. We use real-time market price comparisons to constantly adjust prices to provide ALL BUYERS The BEST VALUE PRICE possible. Pricing Info Good Today Through Close of Business. Prep and Delivery Cost May Apply. We utilize state-of-the-art technology to constantly monitor pricing trends in order to offer our shoppers our best competitive pricing and value. Our entire team is committed to helping you buy a car the way we would want to buy a car! Proudly serving all of North Carolina, Rocky Mount, Wilson, Nashville, Raleigh, Cary, Wake Forest, Rolesville, Elizabeth City, Wilmington, Spring Hope, Greensboro, Greenville, Roanoke Rapids, Bunn, Wendell, Zebulon, Middlesex, Louisburg, Oxford, Riley Hill, Durham, Chapel Hill, Tarboro, Bailey, Stantonsburg, Elm City, Snow Hill, Winterville, Ayden, Kinston, La Grange, Freemont, Pine Tops, Macclesfield, Pikeville, Halifax, Warrenton, Wendell, Weldon, Jackson, Smithfield, Selma, Clayton, New Bern Wake County, Nash County, Virginia and surrounding areas. Rocky Mount Toyota is Home of the LIFETIME WARRANTY on Lifetime Certified vehicles. All vehicles are sold on a first come first serve basis due to multiple people interested in the same vehicles without prior knowledge.Pricing Info Good Today Through Close of Business. Prep and Delivery Cost May Apply. **BACK-UP CAMERA**, **BLUETOOTH**, **USB CHARGING PORT**, **CARFAX-CLEAN/NO ISSUES**, **EXCLUSIVE NATIONWIDE LIFETIME WARRANTY**, **CARFAX ONE OWNER**, ABS brakes, Alloy wheels, Electronic Stability Control, Heated door mirrors, Illuminated entry, Low tire pressure warning, Remote keyless entry, Traction control. CARFAX One-Owner. Clean CARFAX. Priced below KBB Fair Purchase Price! Certified. 24/33 City/Highway MPG<br><br>Awards:<br> * 2017 KBB.com 10 Best Sedans Under $25,000 * 2017 KBB.com 10 Most Comfortable Cars Under $30,000 * 2017 KBB.com 10 Most Awarded Brands * 2017 KBB.com Best Resale Value Awards<br><br>2017 Predawn Gray Mica Toyota 4D Sedan Camry SE 2.5L I4 SMPI DOHC FWD 6-Speed Automatic<br><br>At Rocky Mount Toyota we believe in "LIVE MARKET PRICING" on all vehicles in our inventory. We use real-time market price comparisons to constantly adjust prices to provide ALL BUYERS The BEST VALUE PRICE possible. Pricing Info Good Today Through Close of Business. Prep and Delivery Cost May Apply. We utilize state-of-the-art technology to constantly monitor pricing trends in order to offer our shoppers our best competitive pricing and value. Our entire team is committed to helping you buy a car the way we would want to buy a car! Proudly serving all of North Carolina, Rocky Mount, Wilson, Nashville, Raleigh, Cary, Wake Forest, Rolesville, Elizabeth City, Wilmington, Spring Hope, Greensboro, Greenville, Roanoke Rapids, Bunn, Wendell, Zebulon, Middlesex, Louisburg, Oxford, Riley Hill, Durham, Chapel Hill, Tarboro, Bailey, Stantonsburg, Elm City, Snow Hill, Winterville, Ayden, Kinston, La Grange, Freemont, Pine Tops, Macclesfield, Pikeville, Halifax, Warrenton, Wendell, Weldon, Jackson, Smithfield, Selma, Clayton, New Bern Wake County, Nash County, Virginia and surrounding areas. Rocky Mount Toyota is Home of the LIFETIME WARRANTY on Lifetime Certified vehicles. All vehicles are sold on a first come first serve basis due to multiple people interested in the same vehicles without prior knowledge.Pricing Info Good Today Through Close of Business. Prep and Delivery Cost May Apply. **BACK-UP CAMERA**, **BLUETOOTH**, SMARTPHONE CONNECTIVITY - BLUE TOOTH, **CRUISE CONTROL**, **USB CHARGING PORT**, **CARFAX-CLEAN/NO ISSUES**, **EXCLUSIVE NATIONWIDE LIFETIME WARRANTY**, **CARFAX ONE OWNER**, Mention this advertisement to the dealer to receive the advertised price.. CARFAX One-Owner. Clean CARFAX. Priced below KBB Fair Purchase Price! Certified. 24/33 City/Highway MPG<br><br>Awards:<br> * 2017 KBB.com 10 Most Comfortable Cars Under $30,000 * 2017 KBB.com 10 Best Sedans Under $25,000 * 2017 KBB.com 10 Most Awarded Brands * 2017 KBB.com Best Resale Value Awards<br><br>2017 Midnight Black Metallic Toyota 4D Sedan Camry SE 2.5L I4 SMPI DOHC FWD 6-Speed Automatic<br><br>At Rocky Mount Toyota we believe in "LIVE MARKET PRICING" on all vehicles in our inventory. We use real-time market price comparisons to constantly adjust prices to provide ALL BUYERS The BEST VALUE PRICE possible. Pricing Info Good Today Through Close of Business. Prep and Delivery Cost May Apply. We utilize state-of-the-art technology to constantly monitor pricing trends in order to offer our shoppers our best competitive pricing and value. Our entire team is committed to helping you buy a car the way we would want to buy a car! Proudly serving all of North Carolina, Rocky Mount, Wilson, Nashville, Raleigh, Cary, Wake Forest, Rolesville, Elizabeth City, Wilmington, Spring Hope, Greensboro, Greenville, Roanoke Rapids, Bunn, Wendell, Zebulon, Middlesex, Louisburg, Oxford, Riley Hill, Durham, Chapel Hill, Tarboro, Bailey, Stantonsburg, Elm City, Snow Hill, Winterville, Ayden, Kinston, La Grange, Freemont, Pine Tops, Macclesfield, Pikeville, Halifax, Warrenton, Wendell, Weldon, Jackson, Smithfield, Selma, Clayton, New Bern Wake County, Nash County, Virginia and surrounding areas. Rocky Mount Toyota is Home of the LIFETIME WARRANTY on Lifetime Certified vehicles. All vehicles are sold on a first come first serve basis due to multiple people interested in the same vehicles without prior knowledge.Pricing Info Good Today Through Close of Business. Prep and Delivery Cost May Apply. **BACK-UP CAMERA**, **BLUETOOTH**, SMARTPHONE CONNECTIVITY - BLUE TOOTH, **CRUISE CONTROL**, **USB CHARGING PORT**, **EXCLUSIVE NATIONWIDE LIFETIME WARRANTY**, **CARFAX ONE OWNER**, ABS brakes, Alloy wheels, Electronic Stability Control, Heated door mirrors, Illuminated entry, Low tire pressure warning, Remote keyless entry, Traction control. CARFAX One-Owner. Priced below KBB Fair Purchase Price! Certified. 24/33 City/Highway MPG<br><br>Awards:<br> * 2017 KBB.com 10 Most Comfortable Cars Under $30,000 * 2017 KBB.com 10 Best Sedans Under $25,000 * 2017 KBB.com Best Resale Value Awards * 2017 KBB.com 10 Most Awarded Brands<br><br>2017 Celestial Silver Metallic Toyota 4D Sedan Camry SE 2.5L I4 SMPI DOHC FWD 6-Speed Automatic<br><br>At Rocky Mount Toyota we believe in "LIVE MARKET PRICING" on all vehicles in our inventory. We use real-time market price comparisons to constantly adjust prices to provide ALL BUYERS The BEST VALUE PRICE possible. Pricing Info Good Today Through Close of Business. Prep and Delivery Cost May Apply. We utilize state-of-the-art technology to constantly monitor pricing trends in order to offer our shoppers our best competitive pricing and value. Our entire team is committed to helping you buy a car the way we would want to buy a car! Proudly serving all of North Carolina, Rocky Mount, Wilson, Nashville, Raleigh, Cary, Wake Forest, Rolesville, Elizabeth City, Wilmington, Spring Hope, Greensboro, Greenville, Roanoke Rapids, Bunn, Wendell, Zebulon, Middlesex, Louisburg, Oxford, Riley Hill, Durham, Chapel Hill, Tarboro, Bailey, Stantonsburg, Elm City, Snow Hill, Winterville, Ayden, Kinston, La Grange, Freemont, Pine Tops, Macclesfield, Pikeville, Halifax, Warrenton, Wendell, Weldon, Jackson, Smithfield, Selma, Clayton, New Bern Wake County, Nash County, Virginia and surrounding areas. Rocky Mount Toyota is Home of the LIFETIME WARRANTY on Lifetime Certified vehicles. All vehicles are sold on a first come first serve basis due to multiple people interested in the same vehicles without prior knowledge.Pricing Info Good Today Through Close of Business. Prep and Delivery Cost May Apply. **BACK-UP CAMERA**, **BLUETOOTH**, SMARTPHONE CONNECTIVITY - BLUE TOOTH, **CRUISE CONTROL**, **USB CHARGING PORT**, **CARFAX-CLEAN/NO ISSUES**, **EXCLUSIVE NATIONWIDE LIFETIME WARRANTY**, **CARFAX ONE OWNER**, ABS brakes, Alloy wheels, Electronic Stability Control, Heated door mirrors, Illuminated entry, Low tire pressure warning, Remote keyless entry, Traction control. CARFAX One-Owner. Clean CARFAX. Priced below KBB Fair Purchase Price! Certified. 24/33 City/Highway MPG<br><br>Awards:<br> * 2017 KBB.com 10 Best Sedans Under $25,000 * 2017 KBB.com 10 Most Comfortable Cars Under $30,000 * 2017 KBB.com Best Resale Value Awards * 2017 KBB.com 10 Most Awarded Brands<br><br>2017 Super White Toyota 4D Sedan Camry SE 2.5L I4 SMPI DOHC FWD 6-Speed Automatic<br><br>At Rocky Mount Toyota we believe in "LIVE MARKET PRICING" on all vehicles in our inventory. We use real-time market price comparisons to constantly adjust prices to provide ALL BUYERS The BEST VALUE PRICE possible. Pricing Info Good Today Through Close of Business. Prep and Delivery Cost May Apply. We utilize state-of-the-art technology to constantly monitor pricing trends in order to offer our shoppers our best competitive pricing and value. Our entire team is committed to helping you buy a car the way we would want to buy a car! Proudly serving all of North Carolina, Rocky Mount, Wilson, Nashville, Raleigh, Cary, Wake Forest, Rolesville, Elizabeth City, Wilmington, Spring Hope, Greensboro, Greenville, Roanoke Rapids, Bunn, Wendell, Zebulon, Middlesex, Louisburg, Oxford, Riley Hill, Durham, Chapel Hill, Tarboro, Bailey, Stantonsburg, Elm City, Snow Hill, Winterville, Ayden, Kinston, La Grange, Freemont, Pine Tops, Macclesfield, Pikeville, Halifax, Warrenton, Wendell, Weldon, Jackson, Smithfield, Selma, Clayton, New Bern Wake County, Nash County, Virginia and surrounding areas. Rocky Mount Toyota is Home of the LIFETIME WARRANTY on Lifetime Certified vehicles. All vehicles are sold on a first come first serve basis due to multiple people interested in the same vehicles without prior knowledge.Pricing Info Good Today Through Close of Business. Prep and Delivery Cost May Apply. **BACK-UP CAMERA**, **BLUETOOTH**, **CRUISE CONTROL**, **CARFAX-CLEAN/NO ISSUES**, **EXCLUSIVE NATIONWIDE LIFETIME WARRANTY**, **CARFAX ONE OWNER**, ABS brakes, Alloy wheels, Electronic Stability Control, Heated door mirrors, Illuminated entry, Low tire pressure warning, Remote keyless entry, Traction control. CARFAX One-Owner. Priced below KBB Fair Purchase Price! Certified. 24/33 City/Highway MPG<br><br>Awards:<br> * 2017 KBB.com 10 Most Comfortable Cars Under $30,000 * 2017 KBB.com 10 Best Sedans Under $25,000 * 2017 KBB.com 10 Most Awarded Brands * 2017 KBB.com Best Resale Value Awards<br><br>2017 Midnight Black Metallic Toyota 4D Sedan Camry SE 2.5L I4 SMPI DOHC FWD 6-Speed Automatic<br><br>At Rocky Mount Toyota we believe in "LIVE MARKET PRICING" on all vehicles in our inventory. We use real-time market price comparisons to constantly adjust prices to provide ALL BUYERS The BEST VALUE PRICE possible. Pricing Info Good Today Through Close of Business. Prep and Delivery Cost May Apply. We utilize state-of-the-art technology to constantly monitor pricing trends in order to offer our shoppers our best competitive pricing and value. Our entire team is committed to helping you buy a car the way we would want to buy a car! Proudly serving all of North Carolina, Rocky Mount, Wilson, Nashville, Raleigh, Cary, Wake Forest, Rolesville, Elizabeth City, Wilmington, Spring Hope, Greensboro, Greenville, Roanoke Rapids, Bunn, Wendell, Zebulon, Middlesex, Louisburg, Oxford, Riley Hill, Durham, Chapel Hill, Tarboro, Bailey, Stantonsburg, Elm City, Snow Hill, Winterville, Ayden, Kinston, La Grange, Freemont, Pine Tops, Macclesfield, Pikeville, Halifax, Warrenton, Wendell, Weldon, Jackson, Smithfield, Selma, Clayton, New Bern Wake County, Nash County, Virginia and surrounding areas. Rocky Mount Toyota is Home of the LIFETIME WARRANTY on Lifetime Certified vehicles. All vehicles are sold on a first come first serve basis due to multiple people interested in the same vehicles without prior knowledge.Pricing Info Good Today Through Close of Business. Prep and Delivery Cost May Apply. **BACK-UP CAMERA**, **BLUETOOTH**, **CRUISE CONTROL**, **USB CHARGING PORT**, **CARFAX-CLEAN/NO ISSUES**, **EXCLUSIVE NATIONWIDE LIFETIME WARRANTY**, **CARFAX ONE OWNER**, ABS brakes, Alloy wheels, Electronic Stability Control, Heated door mirrors, Illuminated entry, Low tire pressure warning, Remote keyless entry, Traction control. CARFAX One-Owner. Clean CARFAX. Priced below KBB Fair Purchase Price! Certified. 24/33 City/Highway MPG<br><br>Awards:<br> * 2017 KBB.com 10 Most Comfortable Cars Under $30,000 * 2017 KBB.com 10 Best Sedans Under $25,000 * 2017 KBB.com 10 Most Awarded Brands * 2017 KBB.com Best Resale Value Awards<br><br>2017 Blue Streak Metallic Toyota 4D Sedan Camry SE 2.5L I4 SMPI DOHC FWD 6-Speed Automatic<br><br>At Rocky Mount Toyota we believe in "LIVE MARKET PRICING" on all vehicles in our inventory. We use real-time market price comparisons to constantly adjust prices to provide ALL BUYERS The BEST VALUE PRICE possible. Pricing Info Good Today Through Close of Business. Prep and Delivery Cost May Apply. We utilize state-of-the-art technology to constantly monitor pricing trends in order to offer our shoppers our best competitive pricing and value. Our entire team is committed to helping you buy a car the way we would want to buy a car! Proudly serving all of North Carolina, Rocky Mount, Wilson, Nashville, Raleigh, Cary, Wake Forest, Rolesville, Elizabeth City, Wilmington, Spring Hope, Greensboro, Greenville, Roanoke Rapids, Bunn, Wendell, Zebulon, Middlesex, Louisburg, Oxford, Riley Hill, Durham, Chapel Hill, Tarboro, Bailey, Stantonsburg, Elm City, Snow Hill, Winterville, Ayden, Kinston, La Grange, Freemont, Pine Tops, Macclesfield, Pikeville, Halifax, Warrenton, Wendell, Weldon, Jackson, Smithfield, Selma, Clayton, New Bern Wake County, Nash County, Virginia and surrounding areas. Rocky Mount Toyota is Home of the LIFETIME WARRANTY on Lifetime Certified vehicles. All vehicles are sold on a first come first serve basis due to multiple people interested in the same vehicles without prior knowledge.Pricing Info Good Today Through Close of Business. Prep and Delivery Cost May Apply. Mention this advertisement to the dealer to receive the advertised price.. Clean CARFAX. 25/35 City/Highway MPG<br><br>Awards:<br> * 2016 KBB.com Best Buy Awards Finalist * 2016 KBB.com 10 Best UberX Candidates * 2016 KBB.com 10 Most Comfortable Cars Under $30,000 * 2016 KBB.com 5-Year Cost to Own Awards * 2016 KBB.com 10 Most Awarded Cars * 2016 KBB.com 10 Best Sedans Under $25,000<br><br>2016 Red Pearl Toyota 4D Sedan Camry LE 2.5L I4 SMPI DOHC FWD 6-Speed Automatic<br><br>At Rocky Mount Toyota we believe in "LIVE MARKET PRICING" on all vehicles in our inventory. We use real-time market price comparisons to constantly adjust prices to provide ALL BUYERS The BEST VALUE PRICE possible. Pricing Info Good Today Through Close of Business. Prep and Delivery Cost May Apply. We utilize state-of-the-art technology to constantly monitor pricing trends in order to offer our shoppers our best competitive pricing and value. Our entire team is committed to helping you buy a car the way we would want to buy a car! Proudly serving all of North Carolina, Rocky Mount, Wilson, Nashville, Raleigh, Cary, Wake Forest, Rolesville, Elizabeth City, Wilmington, Spring Hope, Greensboro, Greenville, Roanoke Rapids, Bunn, Wendell, Zebulon, Middlesex, Louisburg, Oxford, Riley Hill, Durham, Chapel Hill, Tarboro, Bailey, Stantonsburg, Elm City, Snow Hill, Winterville, Ayden, Kinston, La Grange, Freemont, Pine Tops, Macclesfield, Pikeville, Halifax, Warrenton, Wendell, Weldon, Jackson, Smithfield, Selma, Clayton, New Bern Wake County, Nash County, Virginia and surrounding areas.